Ever since the launch of the Interstate Highway system reshaped America’s economy and gave rise to fast-food restaurant chains that promised a predictable meal from New York City to Los Angeles, ‘burger flipper’ has been an idiom exemplifying menial, poorly-paid work. High school kids just entering the work force are often burger flippers; hopefully, your brother-in-law is not. But the Great Recession has reshaped the economy in ways that might make needful an update of our usage, because burger flippers can now disparage ‘permatemps,’ temporary workers doing the blue-collar jobs once protected by strong unions or, at least, state and federal laws. Typically immigrants who want to stay below-the-radar, the poorly educated who lack the skills for work that engages the public, or those discarded by a shrinking manufacturing sector and its declining ancillaries, blue-collar temps often net less than minimum wage after compulsory job-related expenses, frequently are detailed to the most dangerous and dirty work and, still worse, are routinely defrauded out of time for which they are entitled to pay. If they live long enough to collect a check at the end of the day, that is. The Great Recession was followed by a great restructuring, by tectonic changes in the economy itself and in the way we do business. Some jobs are gone forever, and some people earn their living doing work unheard of just a decade ago. In the middle is legacy work clamped between offshore competitors that in some cases enjoy aggressive subsidies from their governments, and a steadily more-restive American middle class that is tired of treading water. Many companies, then, have turned to a silent and all-but-invisible temporary workforce: the illegals, the poorly educated, the working poor who always are on the edge of ruin. The appeal is obvious: No unions, relaxed government regulation, easy dismissals and a ready supply of replacements. ISSSource’s look at this trend, however, finds that it comes with dangers that can easily turn what looks like a smart Boardroom decision into a quality, process, and human disaster. Alarmed by anecdotal evidence that blue-collar temporary work was growing rapidly, with a corresponding growth of serious injuries and fatalities, Ontario’s Institute for Work and Health (IWH) launched a study in 2011 to identify the scope of the problem. What they discovered is a workforce used, usually without training and often with only minimal safety equipment, for the worst jobs. The study includes anonymously-reported quotes from workers and employers that tell the story. The temp system insulates the host companies from workers’ compensation claims, unemployment taxes, union drives and the duty to ensure their workers are citizens or legal immigrants. • Nineteen-year old Day Davis called his mother to tell her he would soon be repaying her for a fender-bender – he finally had scored his first job, working at a Jacksonville, FL-area Bacardi bottling plant via a temp agency. Virtually unsupervised, he was killed before his first work break when 1-ton platform loaded with about 60-cases of liquor crashed down on him. • A New Jersey sugar-bagging plant removed a safety grate covering a sugar hopper because clumping was slowing processing; 13-days later, in spite of a near-injury when a worker almost got caught in the hopper, a temp worker trying to clear blockages was buried alive. • In Mississippi, four companies shared $187,000 in fines when a 25-year old temporary worker died following an explosion caused by welding near a methane storage tank; the worker did not receive training alerting him to its presence. • In Ohio, a temporary worker employed for 9-months without training received a severe electrical shock which left him unable to work for 4-months. 1. The division of responsibilities between temp agencies and client employers allowed worker safety to be neglected. Clients would use temps for the most dangerous work, and the employer – the temp agency – was often incompetent to assess on-site safety and, in any case, not present at the job site and supervising the work. 2. Return to the workforce was often slow and difficult for temps; the temp agency had nothing for them to do on their own premises, and their clients weren’t interested in temporary workers who required special accommodations while recovering from injuries. 3. Bad reporting, with neither the temp agency nor the host-employer willing to accept responsibility for worker injuries or fatalities. ProPublica published a series of articles in December 2013 centering on negligence that resulted in the death of temporary workers, and in partnership with VICE News produced a series of video reports in March which focused on use of temporary immigrant labor. They found, typically, because of intense competition, temp agencies proffer such low bids to clients that a significant part of their profit comes from charging workers for rides to the workplace, shorting their hours, and then charging them a fee for cashing their check at the end of the day. There are now estimated to be almost 3-million permatemps in the United States. In January, 2015, OSHA published a booklet, in English and Spanish, available to all temporary workers and which stresses temporary workers have the same rights as permanent workers. In Canada, where the prevailing law holds the staffing agency responsible for safety and for reporting, the IWH study authors recommended the responsibility be shared jointly. They went one step further, advocating firms that employ large numbers of temporary workers create a health and safety committee especially for their unique needs. While the Ministry of Labour takes the position that temp workers will be protected by the joint health and safety committees at the client employer’s site, the study’s evidence suggests temp workers have their own health and safety needs that are not covered by the client employer. They need their own committees to discuss the special risks they face, such as handling newness on the job, knowing who to talk to when something goes wrong, and how to speak up without risking your job placement. 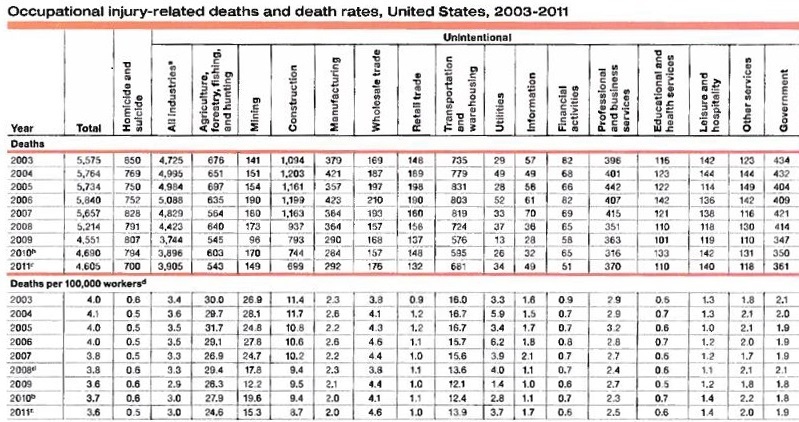 Relying on data provided by the Bureau of Labor Statistics, the National Safety Council prepared a table showing injury and fatality rates in multiple economic sectors. In manufacturing, the death rate has dropped from 2.3 deaths per 100,000-workers in 2003, to 2.0 deaths per 100,000-workers in 2011. In all industries, the rate dropped during those years from 3.4 to 3.0. This is good news, then – right? Not necessarily. If overall death rates are going down, but deaths among permatemps are drawing attention, the statistics may work merely to verify what researchers learned anecdotally – temps are being hired for the most dangerous work and that is where the deaths are concentrated. That would point toward institutional indifference toward the well-being of temporary- and contract-workers. [Blue-collar temp work] is one of our fastest-growing industries, yet one of the few in which the injury rates have been rising. Several states have considered bills protecting temp workers, and all have stalled in the face of strong opposition from business. Even Congress has proved unable to deal with the issue. The Protecting America’s Workers Act has been placed before Congress every year since 2004; in 2010 there were hearings in the House of Representative and … that was the end of it. That bill is not designed specifically to protect temporary workers, but aims to strengthen enforcement of the original OSHA act by increasing fines and penalties. Other countries have already enacted protections for temporary workers. In Korea, the maximum term of temporary employment is 2-years. In Germany, the host employer is obliged to pay temp workers the same wages, and provide the same working conditions, as regular employees. In Chile, a temp agency can be shut down for wage theft or putting workers in harm’s way. Many countries ban the use of temporary workers in hazardous occupations. In Argentina, South Korea and Japan, for example, temp workers are prohibited in the construction industry. In Poland, the restrictions are even more specific: Temp workers can’t be assigned to work at heights, in confined spaces such as tanks or containers, inside machines or with hazardous materials. In the United States, in contrast, companies increasingly use temp workers as a device for end-running laws intended to protect workers, employing them for years without providing any benefits. The Organization for Economic Cooperation and Development ranks the United States 41st, of 43, in protections afforded workers – behind such famously progressive countries as Saudi Arabia, the Russian Federation, and China. Bob Felton is an engineer and freelance writer in Wake Forest, North Carolina.